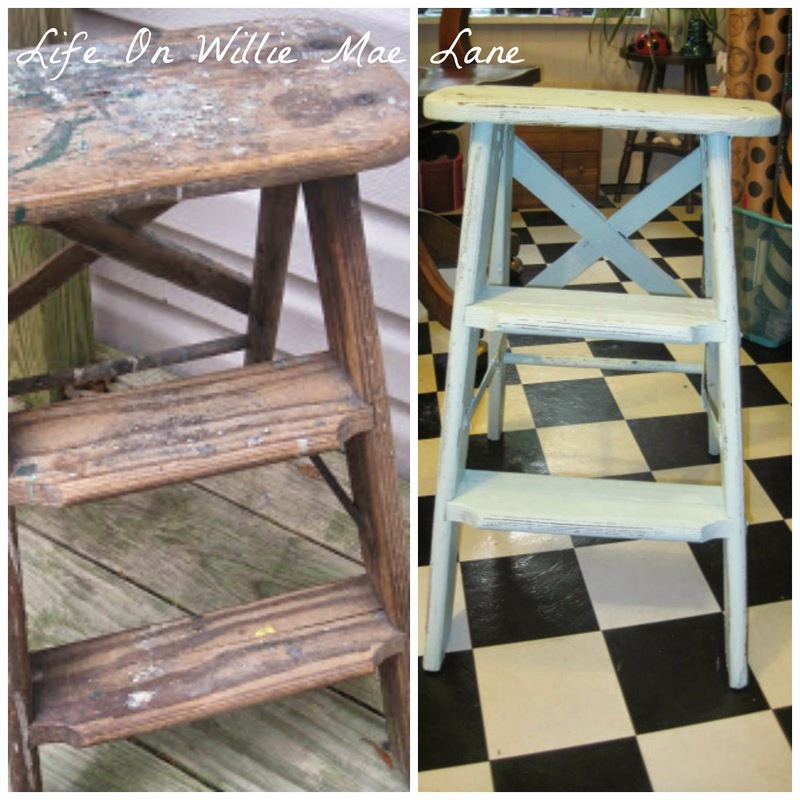 Life On Willie Mae Lane: Before & After Times Two! 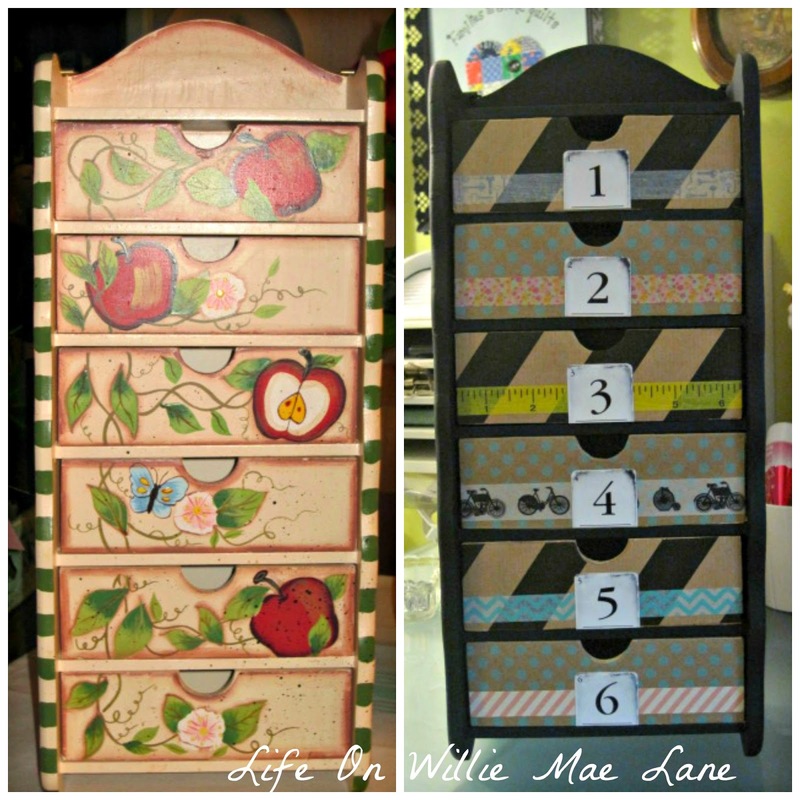 After I painted the ladder, I decided to tackle the little drawer unit that I shared yesterday. It was very cute before but not quite my style, so it got a coat of black paint. The drawers are decoupaged with pieces of wrapping paper. I added the washi tape and numbers after they dried. I placed it on my desk and the drawers contain office supplies. The desktop got a little tweaking to make it fit. You can also see the wicker tray I shared yesterday on the right side. Here's a close-up. I gave it a fresh coat of jade paint which happened to be the same color it already was. It looks much better now. I love this color! One more thing I wanted to share was an update on the box I shared a few weeks ago. I decoupaged some letters on the front to spell embellishments. It turned out super cute! I also added a vintage globe to the top of the shelf too. Love the colors! My craft room is such a happy, colorful space. I know it is a little busy for some, but it is a small space and in order to hold all my stuff, it's going to be busy! I love it though and it makes me very happy! It is the perfect place to be creative in. It is always changing and it will continue to change over the years. I have a couple big changes in store for the future that I am excited about! That's all I have to share for today folks! I'm so glad you stopped by. Have a wonderful Tuesday! Marty from A Stroll Through Life for Inspire Me Tuesday. Great before and after projects Vicky. I love the ladder and how you use it. Your craft room is such a nice place to create. I love the little painted ladder. The ladder looks so great! Love that color. I'm finally home. That ladder looks great and I love the way you have used it! All of your projects are wonderful, as usual. I'm loving the way your ladder turned out! I love your craft room and the way you've filled it with all your treasures. Great job with all the makeovers. I love the color you chose for the ladder. And I never tire of seeing your craft room - I bet the creativity easily flows in a charming room like that. Thinking of you, my friend! I hope the upcoming weekend is lovely! Hugs and blessings! My daughter tells me that my creative space is too busy, but I love it that way. Great color on the ladder! I love your craft room Vicky, and that ladder makeover is fabulous. I love that colour! Thank you so much for stopping at my blog, and taking the time to leave a comment! I really appreciate it, and it's nice to hear from you! I love your projects, all of them, especially the ladder and the little drawers, so wonderful! Please stop by again! I'll be taking time to check out more on your blog!